There was a man who hated Jesus and the lie that was spreading about his so-called “resurrection”. This man knew better than to believe any such conspiracy and hated anyone who did. This man’s name was Saul. He was a zealous Pharisee on a mission to kill or imprison as many Christians as he could. The church was terrified of him, but he had no fear of them or their so- called Lord. Then something happened. This man suddenly stopped trying to destroy the Church and joined it. He stopped trying to kill Christians and begin trying to multiply them. Saul, the enemy of the church, became Paul, the apostle-preacher-bible-writing-martyr for the church. So, what happened? What could possibly explain such a radical change in one man’s life? Answer: this man saw Jesus Christ risen and alive from the dead (Acts 9). 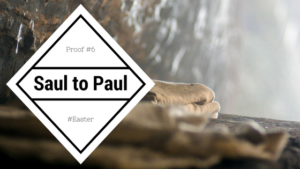 Therefore, his radical change from Saul to Paul can only be explained by the fact that he really saw Jesus alive from the dead, and in seeing Jesus everything changed for him. If the resurrection is a myth, Saul would have remained Saul. But he did not because it is no myth, but a radical life changing event that changed him, and the world forevermore. Make Resurrection Rolls to enjoy! Have kids take one triangle from the crescent roll and one marshmallow. Dip the marshmallow in butter and roll in the cinnamon sugar mixture as you talk about Jesus body being prepared for burial. Lay the marshmallow on the dough and wrap it around the marshmallow and talk about Jesus’ body being wrapped in linen and laid in a tomb. Make sure all seams are pinched together well (or the marshmallow will ooze out of the seams). Bake according to package directions and let cool. Break open the “tomb” and find that it’s empty!